Chilly weather is the perfect time of year to swim with manatees, and one county in the bay area offers the most unique experience in the entire nation. HOMOSASSA, Fla. — Chilly weather is the perfect time of year to swim with manatees, and Citrus County offers the most unique experience in the entire nation. 10-year-old Andry Ellison loves manatees so much that she wants to be a marine biologist when she grows up. “I think that today is going to be the best day of my life," said Ellison. She's excited to swim with manatees. Since the 1970s Citrus County has been the only place in America where you can swim with and touch manatees legally. Manatees flock into the freshwater springs this time of year to stay warm in the 72-degree water. This makes chilly days the perfect time to see them up close. "They will come to you and check you out and stay by your side. They love the human interaction and are very curious," said Gary Bartell Jr. of River Adventure Tours in Homosassa. Manatees are also protected, which is why there are so many rules including: you can’t touch their face, chase them, or kick your feet in the water near them. "They’re adorable. They’re just sweet, they would never hurt anybody," said Ellison. And experiencing them up close gives people a new found love for the gentle creature. "When people get back on the boat, they look at me every time and say 'that was the most incredible experience I’ve ever had,'" said Bartell. There are many companies that offer manatee tours and the best time of year to do it is in the winter months on chilly days. 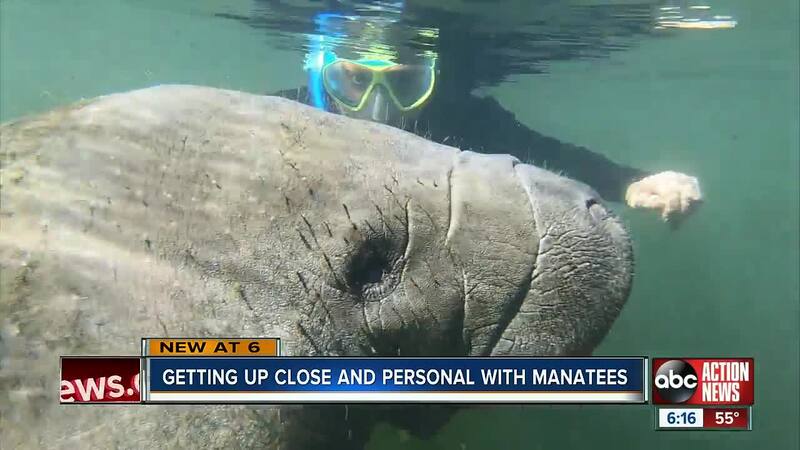 For more information about swimming with manatee tours with River Adventure Tours click here .